Yorkshire (/ˈjɔːrkʃər/ or /ˈjɔːrkʃɪər/; abbreviated Yorks), formally known as the County of York, is a historic county of Northern England and the largest in the United Kingdom. Due to its great size in comparison to other English counties, functions have been undertaken over time by its subdivisions, which have also been subject to periodic reform. Throughout these changes, Yorkshire has continued to be recognised as a geographical territory and cultural region. The name is familiar and well understood across the United Kingdom and is in common use in the media and the military, and also features in the titles of current areas of civil administration such as North Yorkshire, South Yorkshire, West Yorkshire and East Riding of Yorkshire. Within the borders of the historic county of Yorkshire are areas which are widely considered to be among the greenest in England, due to the vast stretches of unspoilt countryside in the Yorkshire Dales and North York Moors and to the open aspect of some of the major cities. Yorkshire has sometimes been nicknamed "God's Own County" or "God's Own Country". 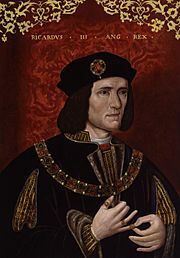 The emblem of Yorkshire is the White Rose of the English royal House of York, and the most commonly used flag representative of Yorkshire is the White Rose on a blue background, which after nearly fifty years of use, was recognised by the Flag Institute on 29 July 2008. Yorkshire Day, held on 1 August, is a celebration of the general culture of Yorkshire, ranging from its history to its own dialect. Yorkshire or the County of York was so named as it is the shire (administrative area or county) of the city of York local i/ˈjɔːk/ or York's Shire. "York" comes from the Viking name for the city, Jórvík. "Shire" is from Old English, scir meaning care or official charge. The "shire" suffix is locally pronounced /-ʃə/ "shuh", or occasionally /-ʃiə/, a homophone of "sheer". 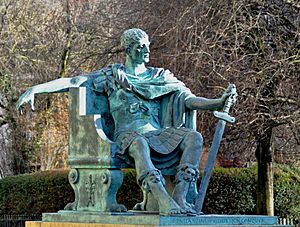 The fortified city of Eboracum (now known as York) was named as capital of Britannia Inferior and joint-capital of all Roman Britain. During the two years before the death of Emperor Septimius Severus, the Roman Empire was run from Eboracum by him. After the Romans left, small Celtic kingdoms arose in Yorkshire; the Kingdom of Ebrauc around York and more notably the Kingdom of Elmet in West Yorkshire. 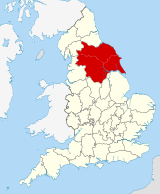 Elmet remained independent from the Northumbrian Angles until some time in the early 7th century, when King Edwin of Northumbria expelled its last king, Certic, and annexed the region. At its greatest extent, Northumbria stretched from the Irish Sea to the North Sea and from Edinburgh down to Hallamshire in South Yorkshire. 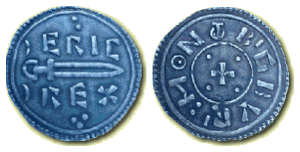 The people of the North rebelled against the Normans in September 1069 AD, enlisting Sweyn II of Denmark. They tried to take back York, but the Normans burnt it before they could. What followed was the Harrying of the North ordered by William. 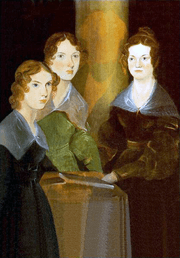 From York to Durham, crops, domestic animals, and farming tools were scorched. Many villages between the towns were burnt and local northerners were indiscriminately murdered. During the winter that followed, families starved to death and thousands of peasants died of cold and hunger. Orderic Vitalis put the estimation at "more than 100,000" people from the North died from hunger. In the centuries following, many abbeys and priories were built in Yorkshire. Norman landowners were keen to increase their revenues and established new towns such as Barnsley, Doncaster, Hull, Leeds, Scarborough, Sheffield, and others. 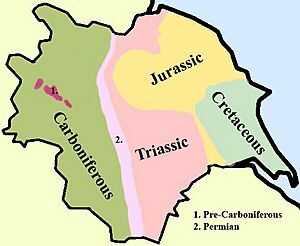 Of towns founded before the conquest, only Bridlington, Pocklington, and York continued at a prominent level. The population of Yorkshire boomed until hit by the Great Famine in the years between 1315 and 1322. The 19th century saw Yorkshire's continued growth, with the population growing and the Industrial Revolution continuing with prominent industries in coal, textile and steel (especially in Sheffield and Rotherham). However, despite the booming industry, living conditions declined in the industrial towns due to overcrowding, this saw bouts of cholera in both 1832 and 1848. Fortunately for the county, advances were made by the end of the century with the introduction of modern sewers and water supplies. Several Yorkshire railway networks were introduced as railways spread across the country to reach remote areas. County councils were created for the three ridings in 1889, but their area of control did not include the large towns, which became county boroughs, and included an increasing large part of the population. 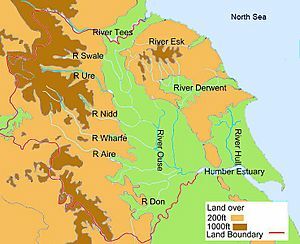 The western Pennines are served by the River Ribble which drains westwards into the Irish Sea close to Lytham St Annes. The countryside of Yorkshire has acquired the common nickname of "God's Own County". Yorkshire includes the North York Moors and Yorkshire Dales National Parks, and part of the Peak District National Park. Nidderdale and the Howardian Hills are designated Areas of Outstanding Natural Beauty. Spurn Point, Flamborough Head and the coastal North York Moors are designated Heritage Coast areas, and are noted for their scenic views with rugged cliffs such as the jet cliffs at Whitby, the limestone cliffs at Filey and the chalk cliffs at Flamborough Head. Moor House - Upper Teesdale, most of which is part of the former North Riding of Yorkshire, is one of England's largest national nature reserves. The Royal Society for the Protection of Birds runs nature reserves such as the one at Bempton Cliffs with coastal wildlife such as the northern gannet, Atlantic puffin and razorbill. Spurn Point is a narrow, 3 miles (4.8 km) long sand spit. It is a national nature reserve owned by the Yorkshire Wildlife Trust and is noted for its cyclical nature whereby the spit is destroyed and re-created approximately once every 250 years. There are seaside resorts in Yorkshire with sandy beaches; Scarborough is Britain's oldest seaside resort dating back to the spa town-era in the 17th century, while Whitby has been voted as the United Kingdom's best beach, with a "postcard-perfect harbour". Historically, Yorkshire was divided into three ridings and the Ainsty of York. The term 'riding' is of Viking origin and derives from Threthingr meaning a third part. The three ridings in Yorkshire were named the East Riding, West Riding and North Riding. The East and North Ridings of Yorkshire were separated by the River Derwent and the West and North Ridings were separated by the Ouse and the Ure/Nidd watershed. In 1974 the three ridings of Yorkshire were abolished and York which had been independent of the three ridings, was incorporated into the new county called North Yorkshire. It later became part of York Unitary Authority. The most prominent road in Yorkshire, historically called the Great North Road, is known as the A1. This trunk road passes through the centre of the county and is the prime route from London to Edinburgh. Another important road is the more easterly A19 road which starts in Doncaster and ends just north of Newcastle-upon-Tyne at Seaton Burn. The M62 motorway crosses the county from east to west from Hull towards Greater Manchester and Merseyside. The M1 carries traffic from London and the south of England to Yorkshire. 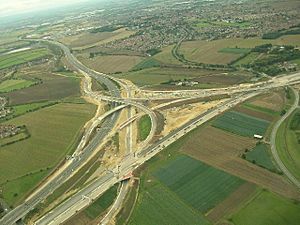 In 1999 about 8 miles (13 km) was added to make it swing east of Leeds and connect to the A1. The East Coast Main Line rail link between Scotland and London runs roughly parallel with the A1 through Yorkshire and the Trans Pennine rail link runs east to west from Hull to Liverpool via Leeds. Before the advent of rail transport, the seaports of Hull and Whitby played an important role in transporting goods. Historically canals were used, including the Leeds and Liverpool Canal, which is the longest canal in England. Mainland Europe (the Netherlands and Belgium) can be reached from Hull via regular ferry services from P&O Ferries. Yorkshire also has air transport services from Leeds Bradford International Airport. This airport has experienced significant and rapid growth in both terminal size and passenger facilities since 1996, when improvements began, until the present day. South Yorkshire is served by the Robin Hood Airport Doncaster Sheffield, based in Finningley. Sheffield City Airport opened in 1997 after years of Sheffield having no airport, due to a council decision in the 1960s not to develop one because of the city's good rail links with London and the development of airports in other nearby areas. The newly opened airport never managed to compete with larger airports such as Leeds Bradford International Airport and East Midlands Airport and attracted only a few scheduled flights, while the runway was too short to support low cost carriers. The opening of Doncaster Sheffield Airport, effectively made the airport redundant and it officially closed in April 2008. Yorkshire has a long tradition in the field of sports, with participation in football, rugby league, cricket and horse racing being the most established sporting ventures. Yorkshire County Cricket Club represents the historic county in the domestic first class cricket County Championship; with a total of 31 championship titles, 13 more than any other county, Yorkshire is the most decorated county cricket club. Some of the most highly regarded figures in the game were born in the county amongst them Geoffrey Boycott, Ray Illingworth, Brian Close, Len Hutton, Herbert Sutcliffe, Joe Root and Fred Trueman. England's oldest horse race, which began in 1519, is run each year at Kiplingcotes near Market Weighton. Continuing this tradition in the field of horse racing, there are currently nine established racecourses in the county. 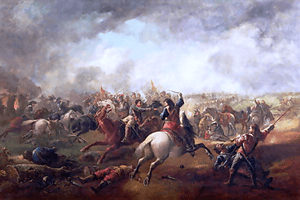 Britain's oldest organised fox hunt is the Bilsdale, founded in 1668. Yorkshire is officially recognised by FIFA as the birthplace of club football, as Sheffield FC founded in 1857 are certified as the oldest association football club in the world. The world's first inter-club match and local derby was competed in the county, at the world's oldest ground Sandygate Road. The Laws of the Game which are now used worldwide were drafted by Ebenezer Cobb Morley from Hull. Football clubs founded in Yorkshire include Barnsley, Bradford City, Doncaster Rovers, Huddersfield Town, Hull City, Leeds United, Middlesbrough, Rotherham United, Sheffield United, Sheffield Wednesday and York City, four of which have been the league champions. Huddersfield were the first club to win three consecutive league titles. Middlesbrough F.C. recently came to prominence by reaching the 2006 UEFA Cup Final and winning the 2004 League Cup. Leeds United are arguably the biggest team in Yorkshire, reaching the semi finals of the UEFA Champions League in 2001 and having a period of dominance in the 1970s; this position is often paralleled with Sheffield Wednesday who have had similar spells of dominance, most recently in the early 1990s, and also house a comparably large fan-base and prestigious history. Noted players from Yorkshire who have influenced the game include World Cup-winning goalkeeper Gordon Banks and two time European Footballer of the Year award winner Kevin Keegan, as well as prominent managers Herbert Chapman, Brian Clough, Bill Nicholson, George Raynor and Don Revie. 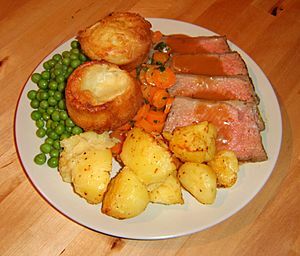 Other foods associated with the county include: Yorkshire curd tart, a curd tart recipe with rosewater; Parkin, a sweet ginger cake which is different from standard ginger cakes in that it includes oatmeal and treacle; and Wensleydale cheese, a cheese made with milk from Wensleydale and often eaten as an accompaniment to sweet foods. The beverage ginger beer, flavoured with ginger, came from Yorkshire and has existed since the mid 18th century. Liquorice sweet was first created by George Dunhill from Pontefract, who in the 1760s thought to mix the liquorice plant with sugar. Yorkshire and in particular the city of York played a prominent role in the confectionery industry, with chocolate factories owned by companies such as Rowntree's, Terry's and Thorntons inventing many of Britain's most popular sweets. Another traditional Yorkshire food is pikelets which are similar to crumpets but much thinner. The Rhubarb Triangle is a location within Yorkshire which supplies most of the rhubarb to locals. During the 1970s David Bowie, himself of a father from Tadcaster in North Yorkshire, hired three musicians from Hull, Mick Ronson, Trevor Bolder and Mick Woodmansey; together they recorded Ziggy Stardust and the Spiders from Mars, an album considered by a magazine article as one of a 100 greatest and most influential of all time. In the following decade, Def Leppard, from Sheffield, achieved worldwide fame, particularly in America. Their 1983 album Pyromania and 1987 album Hysteria are among the most successful albums of all time. Yorkshire had a very strong post-punk scene which went on to achieve widespread acclaim and success, including; The Sisters of Mercy, The Cult, Vardis, Gang of Four, ABC, The Human League, New Model Army, Soft Cell, Chumbawamba, The Wedding Present and The Mission. 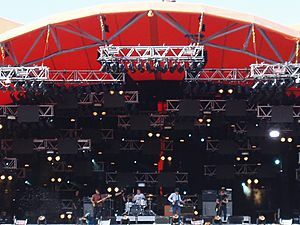 Pulp from Sheffield had a massive hit in "Common People" during 1995; the song focuses on working-class northern life. 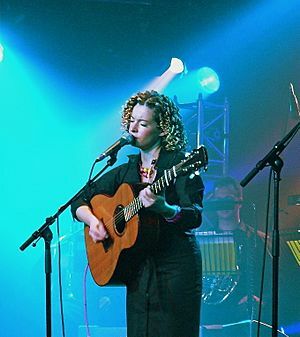 In 21st century, indie rock and post-punk revival bands from the area gained popularity, including the Kaiser Chiefs, The Cribs and the Arctic Monkeys, the last-named holding the record for the fastest-selling debut album in British music history with Whatever People Say I Am, That's What I'm Not. Yorkshire has remained a popular location for filming in more recent times. 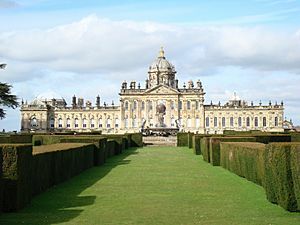 For example, much of ITV's highly-acclaimed Victoria was filmed in the region, at locations such as Harewood House in Leeds and Beverly Minster; the latter was used to depict Westminster Abbey and St James’ Palace. Yorkshire Facts for Kids. Kiddle Encyclopedia.